Indicator Review: A Crack In The Foundation? For some time now, I've referred to the current market cycle as a corrective/consolidation phase. My thinking has been that after a 57% move from February 11, 2016 through January 26, 2018 (a move that included what appeared to be a blow-off top in January this year), a period of "digestion" was in order. And given that the market had experienced one of the longest streaks in history without a 5% correction, a pullback was overdue. From top to bottom, the S&P 500 proceeded to fall 10.1% over a period of one and a half months, which, from an historical perspective, is pretty standard fare for market corrections. Since then, stocks have found their footing and a pattern of higher highs and higher lows has developed on the chart of the S&P. As such, one can argue that the corrective phase likely ended in early April. However, given that the S&P remains below its recent highs and stuck in a range, I believe that the consolidation phase is ongoing. I've also opined a time or two that this corrective/consolidation phase would likely be resolved to the upside. The fact that the NASDAQ, Small-Cap, and Mid-Cap indices recently registered fresh all-time highs has been Exhibit A in my argument. I've also pointed to the readings of some of my favorite longer-term indicators/models as reasons that the bulls ought to receive the benefit of any doubt during this phase. However, I usually add the caveat that if conditions were to change, I would change with them. After all, this is what a risk-manager does - attempt stay in tune with the primary trend. And for the first time in a long time, I have to admit that some of the indicator boards are giving me pause. Then there is the Primary Cycle Indicator board. 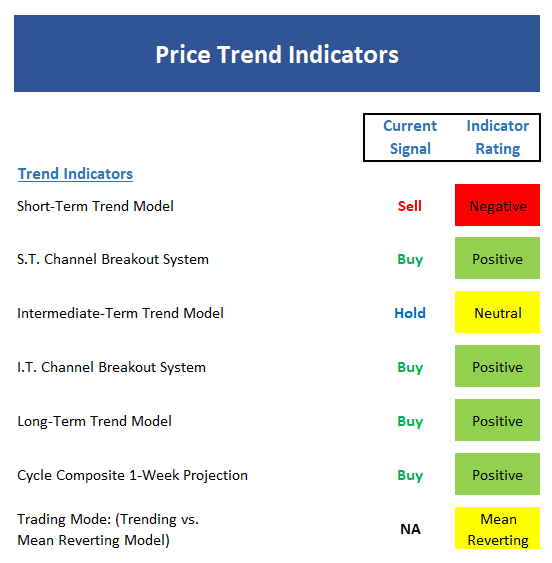 Although three of the five models are on buy signals and another is a hold, only one of the models is green - and the reading of the model is only moderately positive this week. In addition, my "Desert Island Model" fell into the neutral zone last week. While the average historical return of the models in their current state remains above that of the S&P 500 since 1980 (9.7% vs. 8.8%), the fact that the board is now predominantly yellow gives me reason to sit up and take notice. To be clear, there is nothing happening at the present time that demands defensive action be taken. It's just that my indicators/models have clearly weakened and suggest the backdrop may not be as strong as it had been. I'll call a possible crack in the foundation of the bull market. It isn't broken by any means. But, the indicators are telling me to be on heightened alert. I like to start each week with a review of the state of my favorite big-picture market models, which are designed to help me determine which team is in control of the prevailing major trend. Once again, there was some movement among my favorite big-picture market models last week. First, the "state of the tape" model reading downticked to moderately positive. Next, the Risk/Reward model actually upticked enough to get into the neutral zone (but only by a smidge). 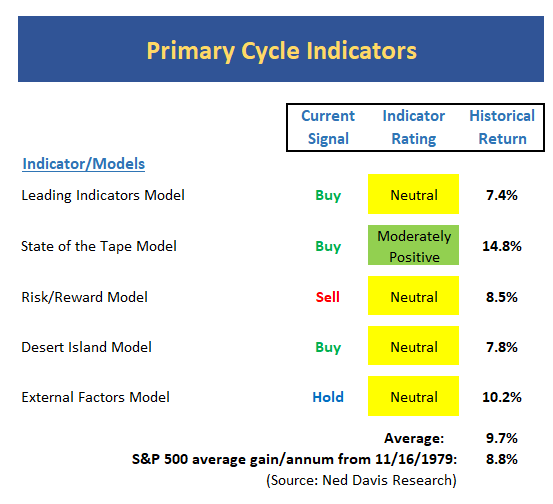 And finally, my "Desert Island Model" fell into the neutral zone - but remains on a buy signal. The short-term trend is now down. In addition, the intermediate-term uptrend that began in early April is now being challenged. A sustained break below 2700 would cause give the bears the edge. While the recent decline has not done a lot of damage to the indices themselves, the momentum board has enough red to warrant attention. 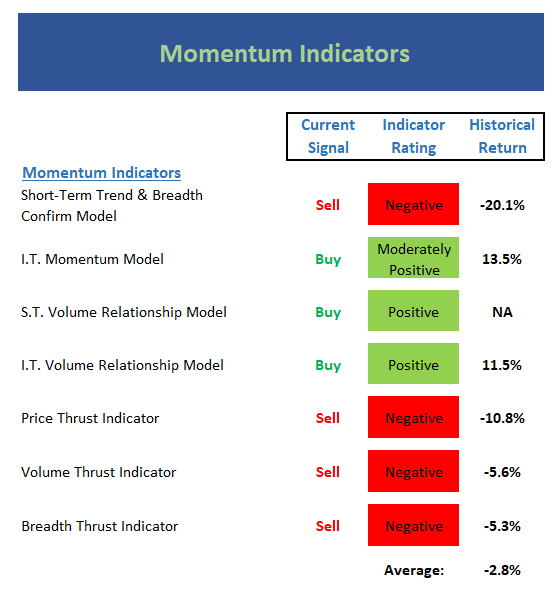 We will be watching to see if any of our longer-term momentum indicators break down. 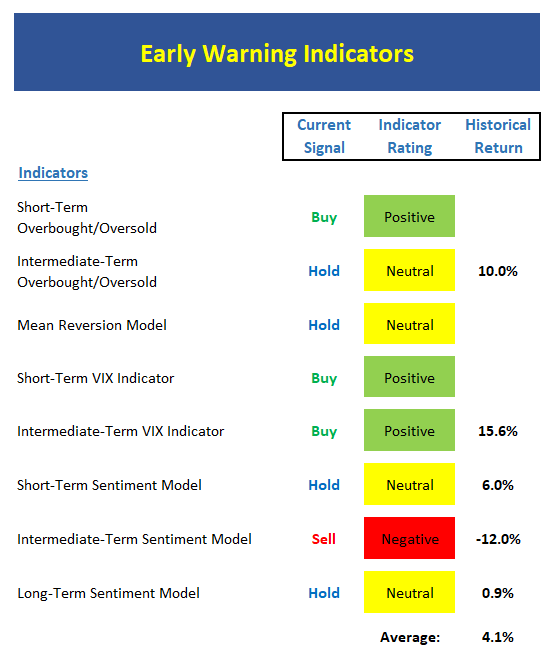 The "Early Warning" board is starting to lean more toward the bullish side. But I wouldn't call this an oversold mandate just yet. 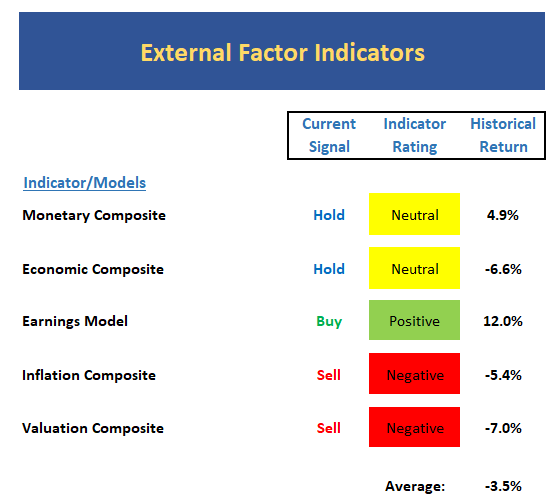 Now let's move on to the market's "external factors" - the indicators designed to tell us the state of the big-picture market drivers including monetary conditions, the economy, inflation, and valuations. The External Factors board is suddenly very conflicted. Although the monetary composite actually upticked to neutral, the economic model downticked. So, with both inflation and valuation models negative, earnings remain the sole positive indicator. You know you are on the right track when you're not interested in looking back.